The global consumption of concentrated forms of protein is increasing rapidly. It is estimated that the use of concentrated sources of protein will double by 2025. In the EU and U.S. protein of plant or vegetable origin accounts currently (2012) for just 44 percent of the total amount of protein consumed. For now, research on how to further increase use of vegetable protein is stagnating, especially when considering emerging developments such as human and animal nutrition, biomaterial, agroprocessing and, industrial usage. It will be important to harness the full potential of vegetable protein applications to ease the strain on the global total protein demand as well as to enhance the competitiveness of agro-harvest commodities. The world food landscape is quickly changing not only because of food security to avoid food conflicts, but also due to the dramatic socioeconomic changes, anthropologically and demographically, on how people respond to food. 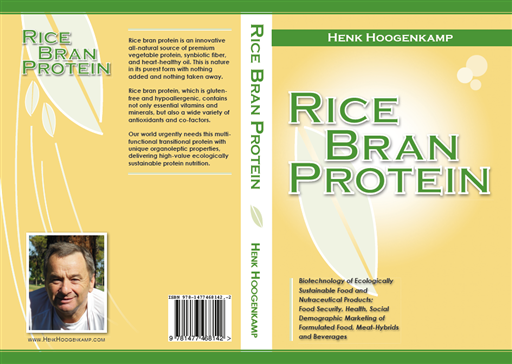 This book unravels and discusses many seemingly unrelated topics where rice bran protein can make a difference, be it malnutrition, T2 diabetes, beverages, gluten-free foods or hybrid meat products. A world renown protein technology expert and globe-trotting, trusted advisor for food companies, academies and contributor to leading food journals. A powerful thinker and communicator about sustainable protein solutions. A selection of articles written by Henk can be viewed by clicking here. Some articles are available for download. I always welcome your comments, queries and suggestions. If you have any queries or need any information, feel free to contact me in regarding era. Please use the form by clicking here or write me to the following email address. I look forward to hearing from you.